There are many things in life that we do not want to prepare for but that we should. A funeral is definitely one of them. Pre-planning major life events is definitely a really good idea but when thinking about our own funeral, it is something we do not really want to do. This is something that most people have problems with because of obvious reasons. In many cases we see that the simple thought that a person dies is enough to not want to do any pre-planning. However, if you were to decide to start pre-planning funeral arrangements, there are some clear cut benefits that you do want to take into account. This is exactly what this infographic is all about. It will highlight so many interesting things that you may not actually have thought about in the past. As a very simple example, when you look at the benefits of funeral pre-planning infographic you will learn about the impact that funeral planning can have on your loved ones. If you die and there is nothing prepared, they will need to deal with everything while being faced with grief and regret. This makes the entire process so much worse than what it should be. The biggest possible benefit of funeral pre-planning is definitely that you get to help the loved ones deal with finances necessary for the funeral. Few people realize this but any funeral is going to be expensive. If you do not prepare you can end up putting your family in the unwanted situation in which there is not much money that is available. That would create so many problems. You have to be sure that you always do all that you can to help the loved ones to deal with the problems caused by your death. This is done through pre-planning. 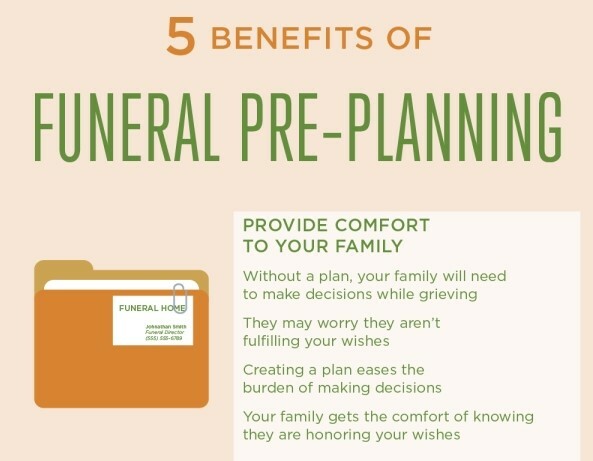 Take a look at the infographic below to learn more about the different funeral pre-planning benefits. It is not at all difficult to understand why you should start right now. Always start as soon as possible. There are some things that can be done even now to prepare for such a bad moment in life.